How Prank Phone Calls to Massage Parlors Got Me an Interview with Joe Mauer. Yup, that's me. 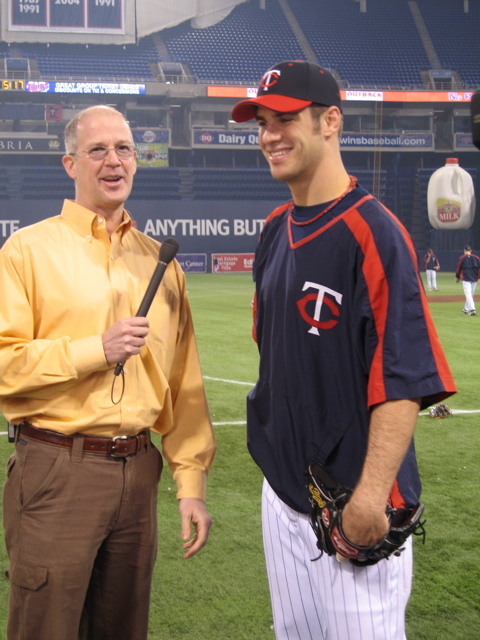 Standing cup-to-cup with the well-known and highly-compensated Joe Mauer of the Minnesota Twins. So how did THAT happen, you ask? How did a pasty-faced nerd like me get time with a Twins great? It's all the result of two things: 1) Prank phone calls I made back in 1983. And 2) my friendship with fellow agency copywriter, Jan Pettit. I've often Jan told that if I ever wrote my life story, I'd devote an entire chapter to her. Well, since that book is not happening, the least I can do is give her a shout out in a blog post...because it was Jan Pettit who single-handedly created my career as a Man-on-the-Street interviewer. Thanks to Jan, I met Twins greats Joe Mauer, Torii Hunter, Paul Molitor, Johan Santana, Michael Cuddyer, Brad Radke, and many more. Because Jan believed in me, I was the on-camera host and interviewer for a video at Kennedy Space Center, I recorded the first man-on-the-street commercials for Chipotle and I did hundreds of radio and TV commercials and videos for companies like Target and Applebee's and Play It Again Sports. And it all started back in 1992 when Jan called me from Martin/Williams and asked me to do some man-on-street radio spots for Abbott Northwestern. I was excited and flattered, but more than a little curious about why Jan thought I would be the right guy for the job. She said, "I remember that tape you brought to work one day. That collection of prank calls." 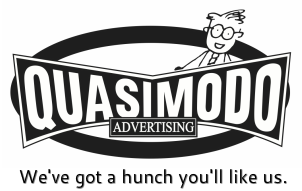 Jan was referring to a decade earlier, when we were both young copywriters working at Grey Advertising. Being new to the big city (I'd moved here from South Dakota), I was struck by how many "health spas" were located downtown. With names like "Barbie's" and "Nirvana". The garish signs suggested they were health clubs, but enquiring minds wanted to know! So...I turned on my cassette recorder and made a few calls. ME: Yes, I'm new to town and I've got a desk job. I really need to find a good place to work out. ME: I was just wondering, do you have an Olympic sized pool? Because I really like to do laps. ME: And what about resistance training. Do you have free weights? Or Nautilus? THEM: We just do massage here. ME: Really? Oh. That's embarrassing. I guess I must have misunderstood. I thought by the sign...you know, Barbie's Health Spa. So...Barbie's not a personal fitness instructor or anything? THEM: There's no Barbie here. THEM: That's just a name. Look, is there something I can help you with? ME: You say you give massages. ME: So, if I guy were looking for, like, a BJ or something. THEM: Can't help you there, chief. And so it went. Thanks to my boyish cheekiness, I was on the streets of Uptown with Jan Pettit trying to wrangle strangers to talk about Medformation, the health information phone line. Before I knew it, I was being asked by other agencies to travel the country talking to people about Old Country Buffet, Sorel Boots, Donato's Pizza, their trip to Kennedy Space...and then, one day, I'm jawing with Bert Blyleven, Justin Morneau and the 2006 Division Champion Minnesota Twins. Would all this fun and good fortune have ever happened without Jan Pettit believing in me? I can't say that it would have. So thank you, Jan. For believing in me. And seeing in me a practical, professional use for what many might see as my impish behavior. It's been a lot of fun. And I owe it all to you. Writer, Voice Actor, Video Editor, Man-on-the-Street Interviewer and the guy with the pastiest legs you'll ever meet.